Sure, a seasonal closet overhaul would be the dream, but between work, budgets, kids, and everything in between, it might be last on your to-do list. 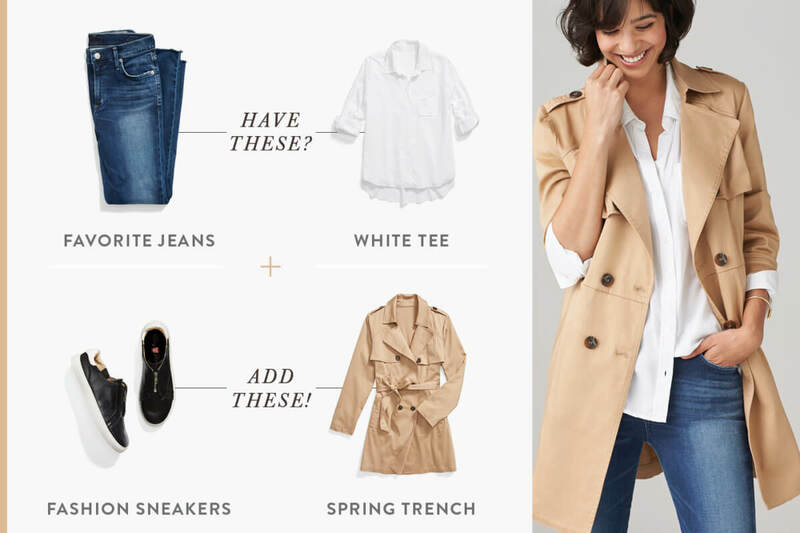 That’s why we’ve created a simple outfit formula that takes tried-and-true staples and injects a healthy dose of seasonal trends. Here are five ways to give your look a boost—instantly. Already have a blazer and boyfriend jeans in your closet? 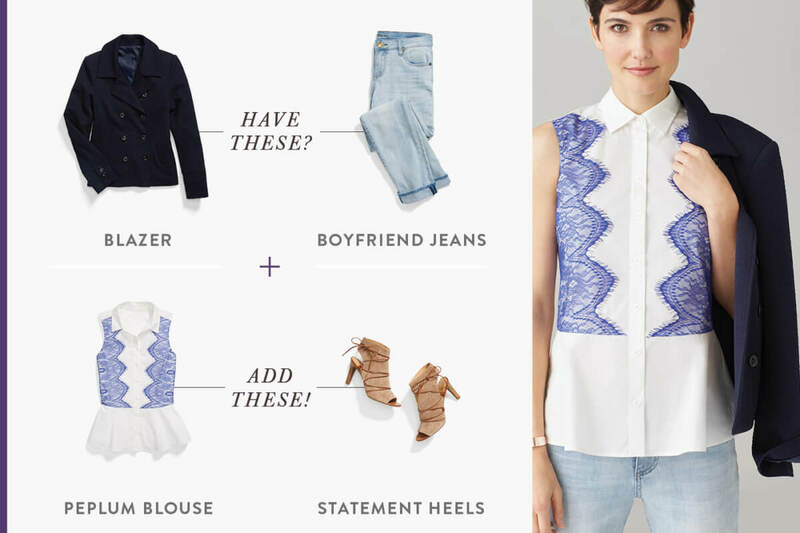 Quickly update your Casual Friday vibes or your weekend go-to by adding lace-up heels and a statement blouse (think: prints, peplum or embroidery details!). Stylist Tip: “The season’s lace-up heel have a sportiness to them that pairs well with jeans. Instead of flats, try heels to add height and elongate your legs!” —Lauren G.
The nonchalance of the maxi dress makes it a staple in nearly every woman’s closet. But sometimes the allure of even our favorite items starts to dull after a season or two. Give your maxi and T-strap sandals some TLC by adding a utility jacket and flirty, wide-brimmed sunhat. Stylist Tip: “Wear your jacket draped over your shoulders for instant, street-style appeal. Plus, when it starts to get warmer, you can still layer without overheating.” —Christina S.
We could write a love song about striped T-shirts—they’re easy to wear, ultra-flattering and always add a hint of that coveted, effortless Parisian-girl style. 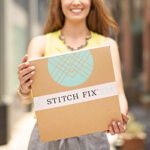 Worn with a basic A-line skirt, you’ve already started with a solid foundation. 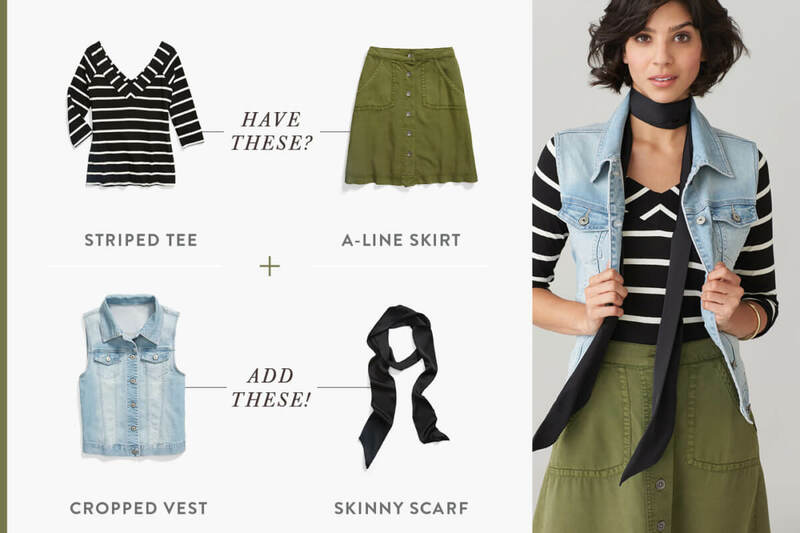 Give it a quick makeover by adding an edgy cropped denim vest and a skinny scarf worn casually around your neck. Voila! When the weather warms up, bust out your white jeans! 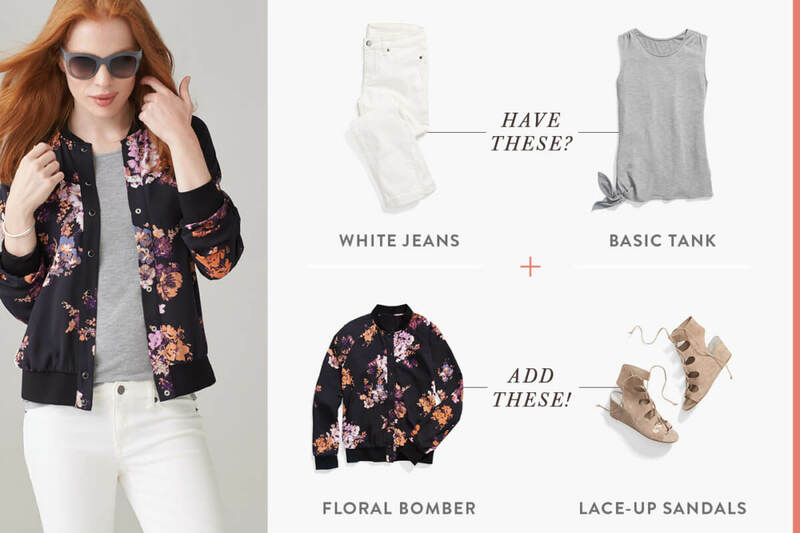 It’s easy to fall into the routine of adding a basic tank, but what if you feel like making a style-splash, pair them with a floral statement jacket and lace-up wedges. Don’t forget the oversized sunglasses for good measure. Stylist Tip: “Neutral basics are the perfect canvas for adding in ultra-trendy pieces. It creates a clean, simple base so that patterns & prints can really pop!” —Emily D.
It’s hard to imagine life without your favorite jeans and a classic white tee— who wants to mess with perfection? To give these closet favorites a simple update keep your look minimal and timeless and just add updated fashion sneakers and a lightweight trench. Stylist Tip: “If you think it’s too hot for a trench coat, look for a sleeveless trench instead! It will give you the same great structure and is perfect for proportion play all season.” —Miranda F.
What’s your equation for boosting your style? Tell us in the comments!